16-year-old Lucía Pérez was drugged, raped and tortured in Argentinian city Mar del Plata earlier in October. On Wednesday, thousands of women joined a national protest against the rise of violent crimes against women. All public and private work was stopped for one hour at 1 p.m., and was followed by a march in Buenos Aires to Plaza de Mayo square. “I know it’s not very professional to say this, but I’m a mother and a woman, and though I’ve seen thousands of cases in my career, I’ve never seen anything like this,” prosecutor Sánchez told local media, according to the Guardian. 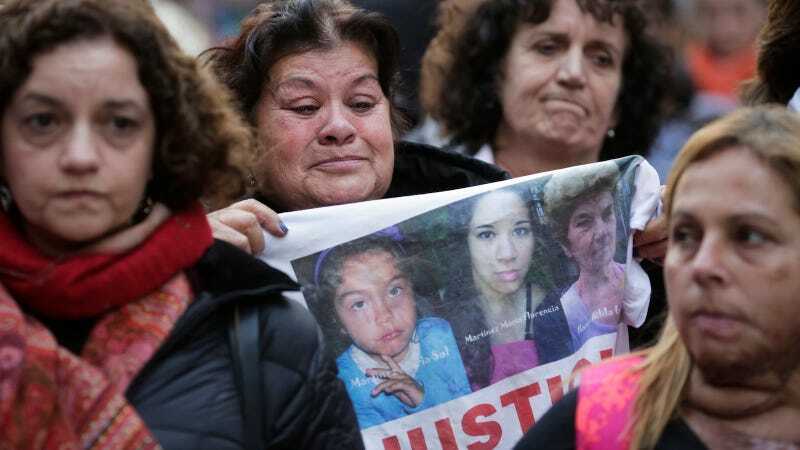 Government statistics have shown that crimes against women have risen 78 percent in Argentina since 2008, though some believe this may be in part due to awareness, increasing the likelihood someone would report such a crime. Lucía Pérez died just a few days after tens of thousands of women marched in the city of Rosario, in a similar protest. When the crowd gathered outside the city’s cathedral, police fired rubber bullets and tear gas to disperse them. Today’s protest can be followed on Twitter with the hashtag #MiércolesNegro, Black Wednesday.